Gettelfinger: “Clearly, these companies are on a roll." DETROIT -- UAW President Ron Gettelfinger said today that even though Ford Motor Co. restored a tuition benefit for hourly workers, it’s too early in the industry recovery to say what the union can claw back in 2011 contract talks with the Detroit 3. Riding a first-quarter profit of $2.08 billion, Ford told the UAW on May 13 that it would restore the tuition payment program. It also restored merit raises, tuition benefits and 401(k) matching payments for salaried employees in December. Speaking here at an Automotive Press Association luncheon, Gettelfinger said it would be up to the next UAW president to negotiate the next agreement in 2011. 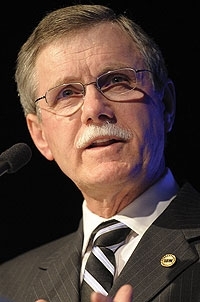 UAW Ford Executive Vice President Bob King is expected to be elected the next UAW president at the union’s national convention in Detroit on June 16. Gettelfinger said Ford’s recent announcement to build battery packs for hybrid and electric vehicles at its Ypsilanti, Mich., plant was an example of the kinds of jobs that are the future of the Detroit 3 and UAW. He said he also was heartened by Chrysler Group’s plan to hire 1,080 workers at its Jefferson North plant in Detroit to build the all-new Jeep Grand Cherokee. Gettelfinger said it was a good sign for the industry and a credit to the sacrifices made by union workers that each of the Detroit 3 can be showing profits on an adjusted annual U.S. industry selling rate of 11 million vehicles. “Clearly, these companies are on a roll,” he said. On the trade front, Gettelfinger said agreements with countries such as South Korea must be rearranged when it results in Korean automakers selling 700,000 vehicles in the United States while U.S. automakers sell 7,000 vehicles in South Korea. Gettelfinger said he believed UAW membership losses had “bottomed out.” He confirmed that membership today is below 400,000. That’s less than one-third the total 30 years ago.